A black hole is a region of space with a mass concentration so large that any nearby object is “sucked” in by its gravitational attraction. So far, the best theory that explains how black hole works is the General Theory of Relativity enunciated by Einstein. 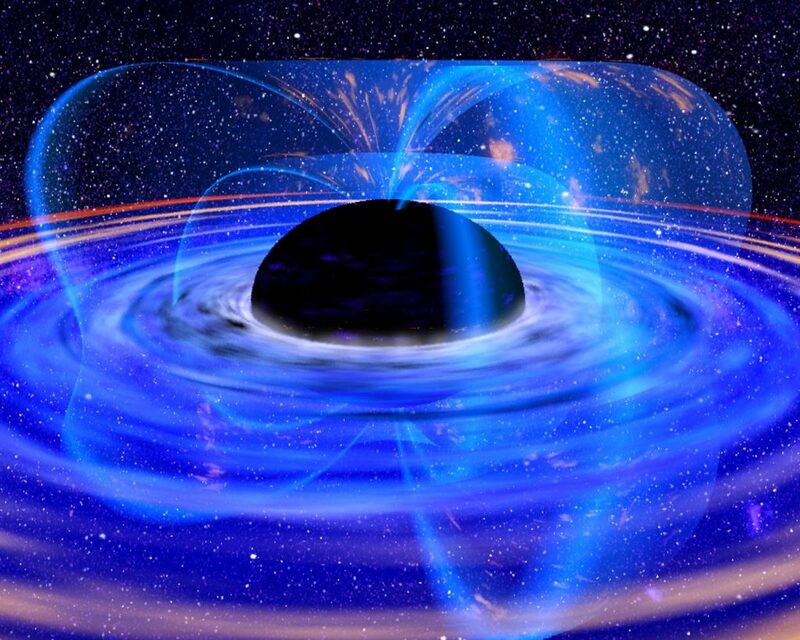 The gravitational force exercised by a black hole is so strong that nothing can escape it, not even light. According to a study published Wednesday in the British journal Nature, the powerful jets of matter emitted by black holes found in the Universe are made partly from heavy atoms of iron and nickel. Ever since they were discovered, astronomers are trying to unravel the mystery of these fine jets of matter ejected by black holes and the phenomena that make up one of the largest energy loads in the Universe. Now, they came up with a new black hole theory that might bring light on the matter. So far, researchers knew that these jets contained electrons (particles whose electric charge is negative). However, the overall electric charge of these jets is not negative, which means that they must also contain positively charged particles in order to restore the balance. Astronomers have just discovered that these particles are actually atoms of iron and nickel. 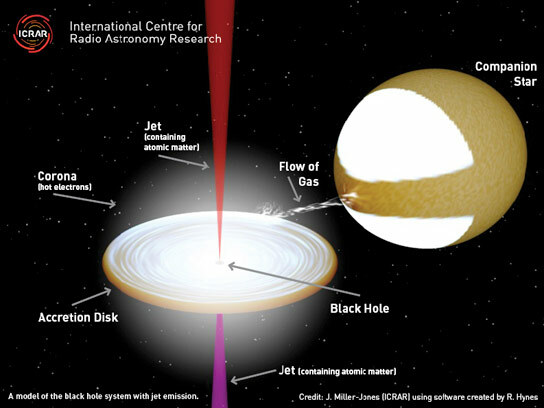 The European XMM Newton Telescope and the Australian Compact Array Telescope were used in order to study the emissions of a small black hole called 4U1630-47 that is moving with a velocity of 2/3 of the speed of light. An iron atom weighs about 100,000 times more than an electron, which means that it carries more important energy than a light particle that travels at the same speed. It seems that the source of these atoms is the black hole accretion disk, a belt of hot gases that revolve around the hole . This finding is especially important as black holes are erroneously considered as destructive phenomena that swallow all celestial bodies and formations that pass through their vicinity. But black holes could also be seen as creative phenomena: they recycle matter and energy in space and their jets play a significant role in star formation of new star within galaxies.